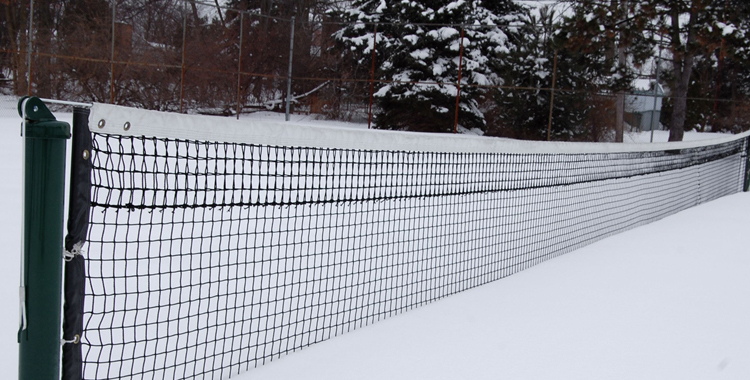 While the days of outdoor, comfortable tennis matches may be few and far between during the coldest Middle States months, winter should never mean a lapse in someone’s tennis game. Snowy or not, winter is the time to get in shape, identify in on weak spots in your game and prep for your next time on the court, whether that be in two weeks or two months. So while your future opponents are bundled up on the couch or sitting by the fire, try some of these winter tennis tips to find yourself one step faster – and one game ahead in your next match. Kick up your gym routine: You get plenty of cardio during the outdoor tennis season, but what about preparing for that cardio now? Try amping up your fitness with a variety of workouts to improve your stamina and endurance. Try to emulate match movements like quick cuts and bursts of speed. Take it slow and always consult with a professional if you’re not sure where to begin. Find your flexibility: You can fight back pain, cramps and other match-killing injuries months before you step back onto the court. In fact, the winter and early spring might just be the time to do it. Studies show that stretching daily over a long period of time (say, four nights per week) increases flexibility, lessens back pain and improves overall movement while limiting pain and muscle pulls. Eye on the prize: Just because you can’t hit a forehand from the baseline or practice drop shots on a daily basis doesn’t mean you can’t improve your control. Hand-eye coordination is one of the keys to the tennis court, and tapping the ball back and forth off the garage door, or simply up and down off your racquet while sitting inside, will improve your coordination and boost your racquet control. Try hitting some one-handed volleys with a partner, or simply practice against a wall. Make the most of your court time: Winter often means less playing time than spring, summer and fall. Quite simply, people don’t have as many opportunities for practice or competition. So this winter, make the most of your court time by focusing on improvement. Rather than simply playing a match, pick out particulars in your game from last year that you want to see improved in 2016. Whether it’s keeping the ball in play more frequently or improving your technique at the net, spend your court time honed in on improving in those areas to see major improvements down the road. Looking for more tips? Check out a recent “Five Tips” article by Seth Walrath, Middle States’ Junior Competition Coordinator.